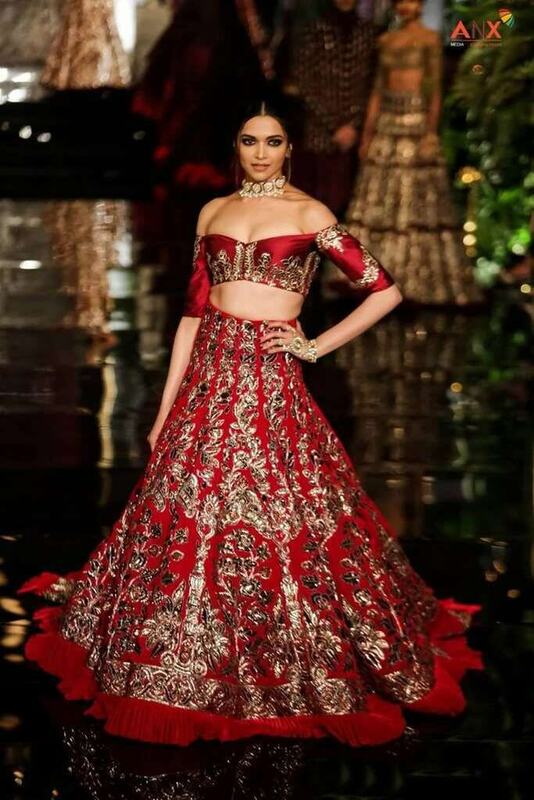 Deepika Padukone stepped on the ramp as a gorgeous bride at the Couture Week 2016. 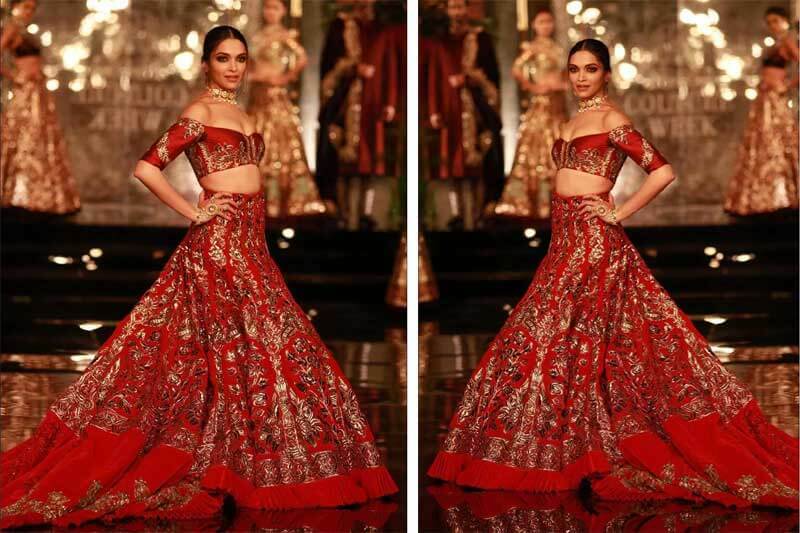 She defines the elegance and grace of the Indian bridal attire with this ravishing red lehenga by Manish Malhotra. The bright red piece is embellished with lovely designer embroidery. The off-shoulder blouse follows the latest trend while the endless trail of its flair makes the ensemble utterly dramatic. She keeps her overall look minimalist with light makeup and a simple center-parted low bun hair style. Another amazing look with women ethnic wear is the one flaunted by Kangana Ranaut, who walked in beauty in the Manav Gangwani Collection at the India Couture Week 2016. 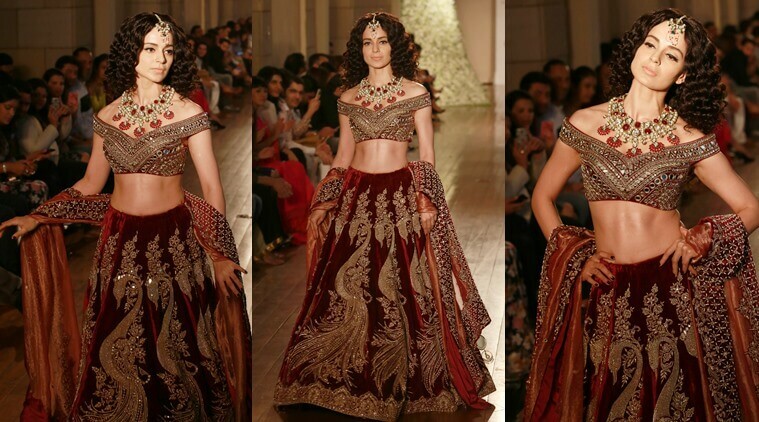 Kangana epitomizes the grandeur of the Mughal Era with this mystical maroon heavily embroidered bridal lehenga. It is teamed with a mesh dupatta and an elegant choli adorned with mirror work. Her natural curls along with minimalist makeup set off the heavy outfit to perfection. The amazing bejeweled necklace forms the centerpiece of the ensemble. To buy ladies ethnic Indian wear in latest designs, do log in to lurap.com and have a look at the fabulous collection. Share an image of your favorite celebrity designer outfit at the “Your Design” section and have an ethnic dress crafted for you. Avail COD and easy EMIs (on shopping over INR 4000 in India) for a wonderful shopping experience. Wanna Look Like A Million Bucks At BFF’s Wedding? Try These Bollywood-Inspired Bridesmaid Lehengas!